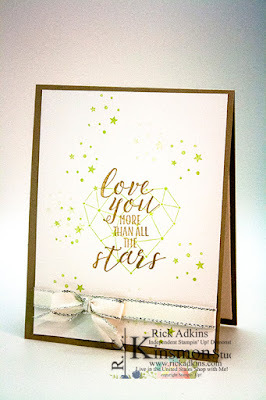 Hello and welcome to my blog; today I am going to share with you my Simple Saturday card for this week. My card this week I used a very unexpected stamp set to make a wedding card. I didn't start out to making a card for a wedding or a bride. I started out to make a card for a new baby. But, when I saw the sentiment that I used in this set I knew it would be perfect. Here's a look at my card. As I said this is a stamp set that was intended for a new baby. 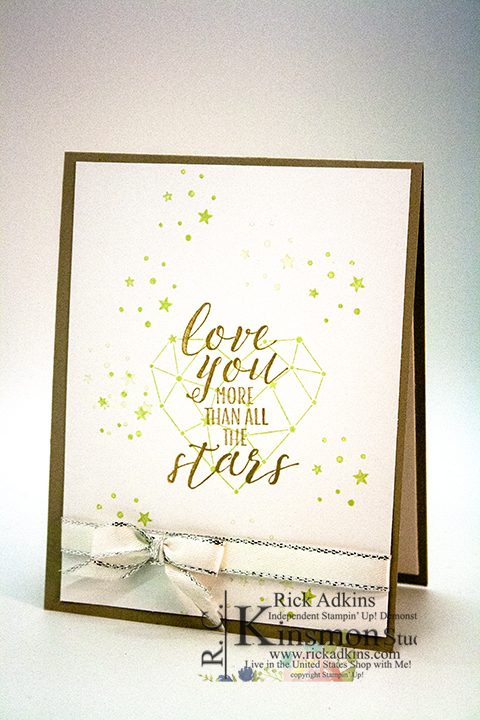 But, when I saw the heart and the sentiment that says Love you mare than all the stars I thought it was just perfect for a #simplestamping bride card. I know that this is a super simple card but it looks so elegant with its simplicity. 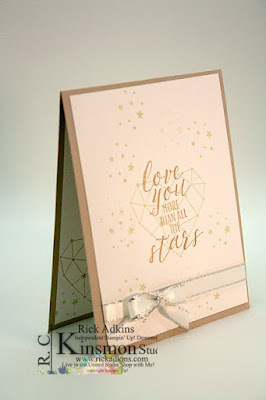 Simple Stamping is a way for me to teach someone that has never picked up a stamp before. This was me just four short years ago. I had never picked up a stamp but the one time I did it was amazing. I had to watch a lot of videos to learn how before I even touched a stamp. I hope that this series is helping someone out there that is currently in the same situation that I was in four years ago. The moment you pick up that first stamp and ink it up and place it on a piece of cardstock is the moment that one little action will change your life. There's nothing like feeling this way and you will remember it the rest of your life. I hope that I have inspired you if you have never picked up a stamp and you're longing to try. Or even if you have been stamping for years I hope that I might have inspired you a little bit. Thanks for dropping bye today, you can find a list of the supplies that I used below in the shopping list. Use my host code this month on any order of $50 (before taxes and shipping) and I will send you a free PDF tutorial and a hand made thank you card. If your order is over $150 please don't use the host code. You will qualify for Stampin' Rewards.